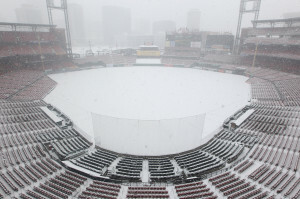 Outdoor hockey is finally coming to St. Louis. The NHL hosted a press event for the 2017 NHL Winter Classic on Tuesday at Busch Stadium. NHL Commissioner Gary Bettman was joined by Blues Chairman Tom Stillman, Blues President & CEO Chris Zimmerman, Cardinals President Bill DeWitt III, St. Louis Mayor Francis Slay, St. Louis County Executive Steve Stenger as well as Colton Parayko, and former players Bernie Federko and Bob Plager. The 2017 NHL Winter Classic will be held Monday, Jan. 2 at noon. An alumni game featuring Blues greats Bernie Federko, Al MacInnis and Chris Pronger will take place on December 31st vs a group of Blackhawks alumni.